to get you just the sound you’re looking for. How about a vintage jazz orchestra? Blue grass band? Or the dopest 80’s dance band? Italian accordians? Yup. AMS can recommend live performances to fit your style for pre-ceremony, ceremony, cocktail, and dinner music. Leave the live wedding music logistics to AMS. We’ll coordinate contracts, arrival, setup, payment and all that stuff between the venue and musicians. Just sit back and enjoy the melodies. All the musicians we work with are bonded and insured to perform on venue properties. We carefully screen our musicians to meet the highest criteria for musical performance, professional conduct and etiquette. Email or call, text 707-823-7359 to get expert assistance in choosing the perfect artist for your wedding or event. The SKYLINE Ensemble is a modern approach to live music. They are our flagship group that can play a great choice of contemporary pop music but can also play classical, baroque, swing, jazz, and pop favorites as well as Jewish, Italian, and continental repertoire for weddings or background music at corporate and private events. Duos & Trios are best for events up to 125 guests but can be amplified for slightly larger groups. Romantic songs for proposals, intimate dinners, formal dining, small parties, housewarmings, birthdays, graduations, any other special event in a small to medium-sized venue. Especially nice for small weddings. This band is special, because they are so versatile. The Hit Waves Unplugged offers exquisite musicianship with every note, whether it is soothing instrumental backgrounds or dance floor packing vocals. You can select from one to five pieces depending on your budget and the sound you’re looking for. If you’re looking for cocktail and dinner music, The Hit Waves can perform an eclectic mix of songs from the 1920s to today; from Sinatra to Michael Jackson; from Ella to the Beatles. You name it! If you’re looking for ceremony music, these artists can perform the classics with finesse as you walk down the aisle. You will truly feel like royalty! If you love the acoustic sound of guitar, piano, bass, drums and vocals performed by masters of the song, the Hit Waves is your kind of band. The appeal of the Rat Pack’s music crosses every age barrier. Sinatra, Sammy Davis, and Dean are still hip. Looking for a sure fire crowd pleaser for your next event? You need the AMS Rat Pack Ensemble. They are in high demand. Call now to check on availability. Rick’s ensembles are a popular choice for wedding and events because of the diversity of musical styles and instrumentation. Configurations include duos, trios, quartets, with a variety of instruments. Musical performances can range from Classical, Jazz, Brazilian, Italian Jewish and contemporary. Justin is a highly experienced musician, a passionate performer, and maintains a friendly professionalism. He is fluent in many musical styles, including classical, jazz, popular, folk, Spanish, and South American. He treats each event on an individual basis, and enjoys collaborating with his clients over e-mail, phone, Skype or in-person consultations. If you are unsure of the music that would best suit your needs, he has the expertise and intuition to help create the perfect musical sound-scape for your special event. He has a number of standard wedding pieces that have been beautifully arranged for the classical guitar. And if you’re looking for non-traditional repertoire he can even arrange your favorite songs. Classical and Flamenco guitarist. 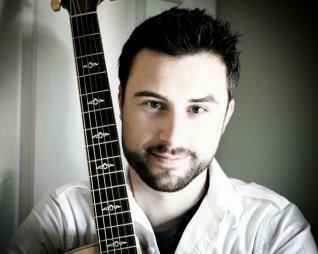 Mark is an international recording artist, performer and teacher. 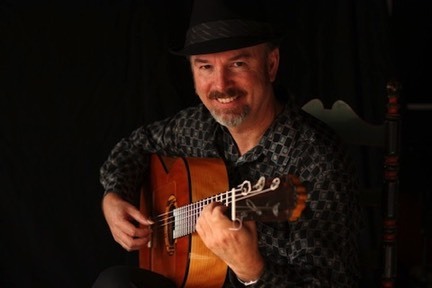 His combined experience in classical and flamenco music makes him a strong and dynamic interpreter of the classical repertoire with an approach to flamenco that is rhythmically vibrant, passionate and true to the essence of the many styles he performs. People rarely wear two hats well, but Bobby is an exception to the rule. Along with being an award-winning singer/songwriter, Bobby Jo Valentine is also a 5-star wedding musician, and has been flown all over the nation to provide the perfect music for a couples’ most important, romantic day. 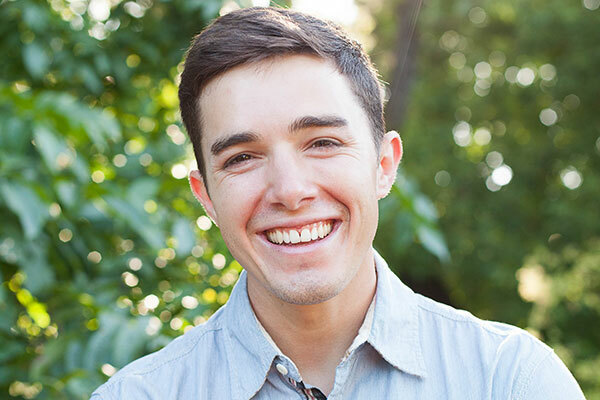 He sings upbeat, soulful, romantic music – both modern and timeless – along the lines of Jack Johnson, John Mayer, The Lumineers, and Jason Mraz, and many clients end up choosing his originals for processional music/first dances/etc. He also plays proposals for clients about to pop the question. Justin Diaz has a young face and an old soul. He is new to AMS, but by no means new to performing high quality music all over the world. Justin was raised in the Napa Valley, the son of Dutch and Mexican immigrants, where the soundtrack at home was varied and eclectic. From his earliest years, Justin sang along, and it quickly became evident that he had a big voice and a keen musical ear. With over a decade of performing experience he has honed his skills in interacting with patrons and communicating with clients. He has traveled to 60 countries and 50 states; thoroughly observing cultures, music and people along the way. These experiences have equipped him to provide the service of high quality music at the times when it really matters; when memories are being created and when excellence is of the utmost importance. His repertoire is in excess of six hours; he has performed hundreds of times at weddings, corporate & VIP events, wineries and everything in between. Jazzy. Seductive. Smooth. We’re talking the great sound of Vintage Jukebox! When your event needs a classy jazz singer backed by a hip combo, you need Vintage Jukebox. They know how create that long-after-midnight mood no matter the time of day! In the mood for timeless music? Then the Vintage Orchestra is perfect for your event. Ellington, Gershwin and Goodman never go out of style. This big band knows how to perform the classic Big Band tunes with the flair and professionalism guaranteed to delight your guests! The Plectrum Duo plays jazz guitar music from the 1930s. Originally started by Morris Acevedo and Cody Anderson in the summer of 2008, the duo has expanded to include bass and percussion. Influenced by guitar greats Django Reinhardt and Eddie Lang, the Plectrum Duo brings the energy and inventiveness of early jazz music to live performance. We like to play this music and find that people enjoy listening. We’re easy to get along with, show up on time, and play like we mean it. .
Ed’s bands play traditional bluegrass. 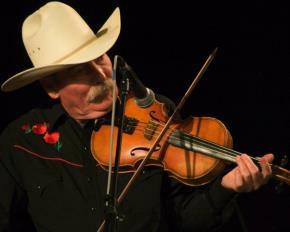 His musicians represent current and historic membership of some of the most well-known bluegrass bands in northern California and beyond. The core group consists of Ed on Mandolin/fiddle – tenor and lead vocals, Mike on guitar and lead vocals, Jeff on Bass and tenor and lead vocals, Paul on fiddle and jokes, and Larry and George rotate on the banjo – Larry also sings tenor and lead. BUT you never know who might show up from where. This is an internationally known venue and a stop on many Bluegrass travelers itinerary, frequently guest performers show up and sit in for a tune or two. It’s always a great evening of exciting music, new friends and BIG fun. 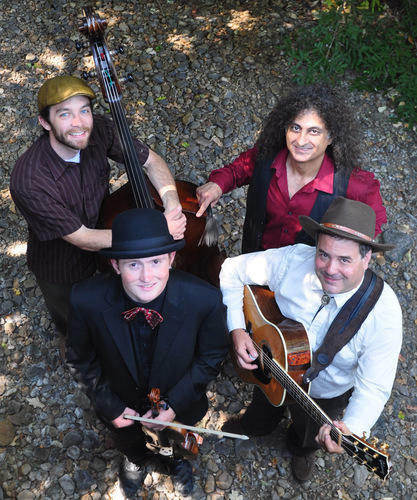 Enchanting and exciting, this acoustic band (stand up bass, vocals, guitar, fiddle, light world drums) draws upon pop, jazz, world, classic country, rock, folk, bluegrass, and jam band sounds when composing and interpreting a diverse array of classics.